In addition to playing Jimi Hendrix in the tentatively titled Not The One With Andre 3000 In It, The Other One, Anthony Mackie will also be joining Seth Rogen, Joseph Gordon-Levitt, and their 50/50 director Jonathan Levine in a previously announced Christmas-themed comedy set to shoot this summer. The three will play childhood best friends who reunite on Christmas Eve for as-yet-unspecified shenanigans. 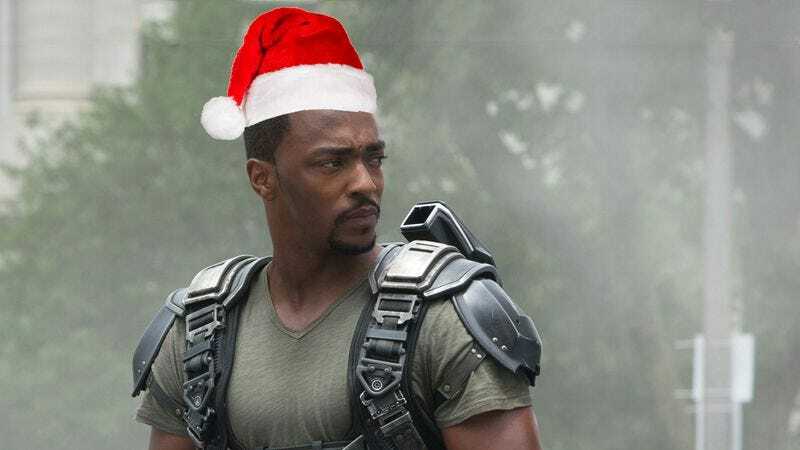 It’s a busy year for Mackie, as besides playing Hendrix and The Ghost Of Christmas Yet To Come (that’s who we’re assuming the three friends are, until we hear otherwise), the actor will also be appearing with Jennifer Connelly in Shelter, with his Captain America: The Winter Soldier co-star Chris Evans in A Many Splintered Thing, with Casey Affleck in crime drama Triple Nine, with Evans again in the inevitable Captain America 3, and with Benedict Cumberbatch, in a private ceremony in which the “Guy Who Is In Every Movie” crown is passed on.